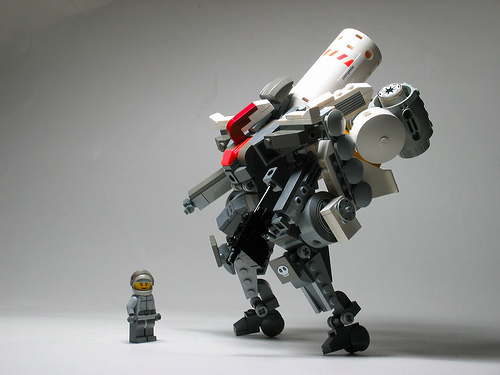 I’m astounded that this mecha by FateHeart manages to even stand up. The tank, or whatever it is, sticks even farther off the back than the jetpacks do, and looks cool at the same time. The dainty wheeled feet add to the off balance look, and the whole thing just works. I really like this guy’s mecha. He is new on the Flickr scene, but he has a really unique style. I love it! I must try to build something like that.